My blog post yesterday about the benefits I’ve seen on the 4-Hour Body, Slow Carb Diet was one of the most talked about blog posts I’ve done in a while. I know from it I’ve sold a few copies of Tim Ferriss‘s book, The 4-Hour Body, and peeked the interest of many of my friends. Something people have been asking from me was the recipe for my breakfast. 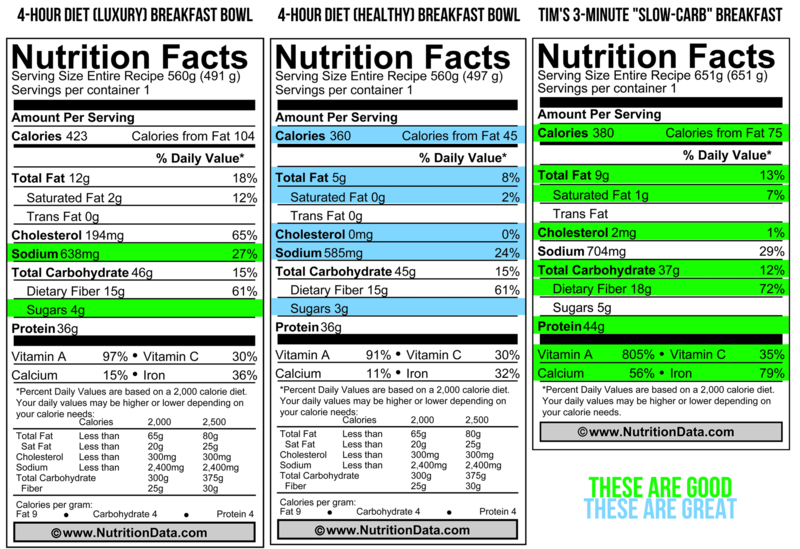 Being the data-obsessed guy that I am, I didn’t want to put out a recipe without all the nutritional information. Especially since this recipe is directly connected to a diet plan. I put the necessary information into NutritionData.com and got my results. YIKES! Even though I’ve shown some great results, the nutrition of this scramble isn’t nearly as good as I had hoped. I then compared it with the recipe Tim uses on his blog as a comparison. His is faster and healthier than the “luxury” version of my recipe. The “healthy” alternative version I provide is actually a better tasting and arguably more nutrient-dense recipe than Tim’s, problem is it takes a lot more work (ten minutes vs three minutes). Perhaps look at my recipe for the person not totally committed to the Slow Carb Diet. Also worth noting, I typically use 100% egg whites but to make the scramble richer, I did 2 part egg white, 1 part full egg which is why there is so much more cholesterol and a little more fat.